Imagine if 80% of posts in your feed were the gold you want to respond to, the ones you’ll laugh at, the posts you actually want to read. Of course, we still need at least 20% to be slightly irrelevant so distract/potentially inspire us. That’s the well-filtered world we could be living in now, if we could just figure out who to follow, who to prioritise and how to manage it all. Currently, networks like Facebook present us with more options than a food court. Friends, Photos, Events, Apps, Lists, Subscriptions, Groups, Pages and soon Timeline Advertisements… It’s an untameable beast. lessen the burden of just maintaining what was once so enjoyable to engage with. To this end, the idea of measuring clout – to show who are the most influential people on a social network – could be endlessly useful. 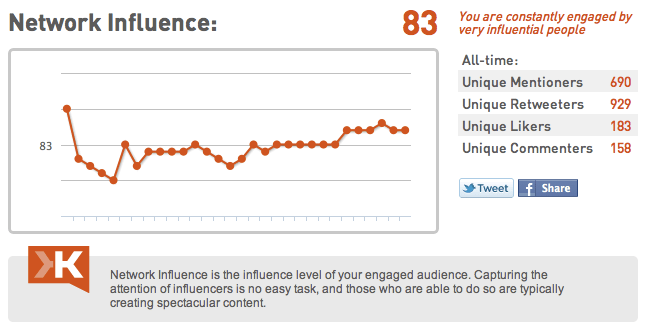 I’ve seen many stories about why Klout.com is feted as a measure of social capital. And it does seem a vaguely accurate marker – however easily manipulated. Here’s how… Lists. Twitter Lists. Do you add anyone to your Twitter lists who you don’t respect? It takes longer than to follow someone, and you only look at it for a specific purpose, not while window-shopping on your general twitter feed. Barack Obama is listed 170,271 times. And rightly so. Secondary to how many times you are listed, is who has you listed. Do they have many followers? Are they listed many times? This could also form a way for Twitter to select top posts. Currently, that algorithm seems hooked on a user’s number of retweets and follower numbers. Mashable says that there’s a need to quantify someone’s ‘reach, relevance and resonance’ to measure their social influence accurately. (Read more of this dubious claim.) However, influence is dependent on subjective reasons too, like likeability – for example, Barack Obama is of much less influence to you if you are a Republican, or if you live in Iceland. Just a quick note on this much ignored feature of Twitter. I love them as a bookmark, as something to retweet or reply to later… They have many uses. But… they’re UNPROTECTED. TV Newsreader Pete Overton likes to add a favourite star to compliments of himself (admittedly, something many of us probably do). Model and TV personality Sarah Murdoch has two favourites – and one is just creepy.